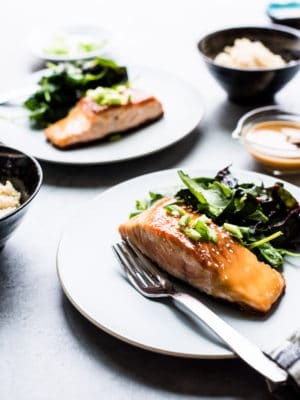 Miso Maple Glazed Salmon brings a taste of sweet and savory to the table in 15 minutes or less. In a small bowl, whisk together the miso, rice vinegar, maple syrup, sesame oil and ginger until smooth. Heat the olive oil in a frying pan over medium to medium-high heat. Pat the salmon fillets dry with paper towels, season with salt and pepper. When the oil begins to glisten, add the salmon skin side down, and cook for about 7 minutes, or until the skin is crispy, and you can see the flesh of the fish lighten in color as it cooks through. Carefully turn the fillets to cook on the flesh side for another 3-5 minutes, or until done to your liking. Transfer the fish fillets to a plate lined with paper towels to rest. Brush with the maple miso glaze. Wipe out the pan, then melt the butter. Add the Swiss chard, season with salt and pepper to taste, until just wilted. Serve the salmon with the wilted greens, garnish with sesame seeds and scallions, with brown rice, if you wish.